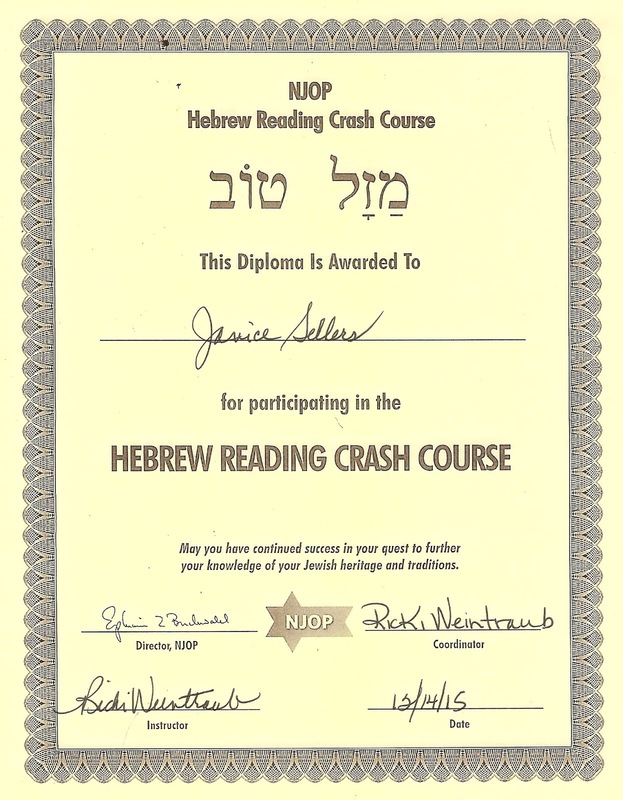 Ancestral Discoveries: I Started Learning to Read Hebrew! Sounds like a great course ... I wish I lived closer to San Francisco! I've been working on transcribing a lot of my ancestors' matzevot lately, and I'm amazed at how much I'm picking up just from that exercise, even though I've never had any formal training in Hebrew. I even surprised myself by instantly recognizing the words "mazel tov" at the top of your diploma! NJOP is nationwide, so you might want to check the site and see if you can find a class close to you. And I also was happy to see that I recognized "mazel tov!" 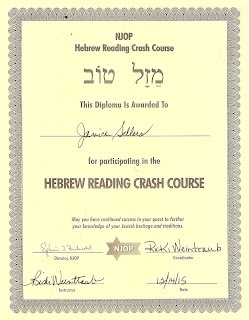 There are wonderful classes at YouTube University :D That's where I've been studying Hebrew. I've been told that there is an old script Hebrew that is not exactly ancient but not as modern as today's ???? I am unable to translate the death record of one of my German grandfathers because no one I've met can translate the old script ( not to mention the German!) I would love to know where he's buried. I'm only talking about the 1700's. Are you aware of any differences in Hebrew script (s)? I know there are differnces in Hebrew script, but I don't know how to read them. Are you signed up on JewishGen.org and for the main e-mail list? You could post a scan and then ask people on the e-mail list if they can help you translate it. People on the list are very helpful and generous. I AM a member of JewishGen.org :D Thanks for the reminder! I wasn't aware that I could post a picture. Surely there is someone out there that can help translate at least part of the entry. Under the Research tab on the home page, click on ViewMate and follow the instructions there. Good luck! I successfully submitted my photo! I suppose they will contact me via email with any responses? You will increase your chances of a response if you post on the e-mail list, describe what help you're asking for, and give the URL for where your photo is posted. They people can respond either on the ViewMate page or directly to you. I declare! I've already received a response and am overcome with joy!! A member provided Hebrew translation but now the records don't completely jive. My ancestor's death record states he died in 1840 and was 84 and 1/2 years old but the Hebrew notes say that he was born in 1772. Another interesting fact that I've learned is that my ancestor changed his surname to Rosenheim or rather, adopted it as a surname when he moved to Altenstadt. Prior to that he was Yaakov Levi or Levy. I'm wondering if Jacob was the son of Levi since he and his father probably didn't have a surname. Any thoughts? 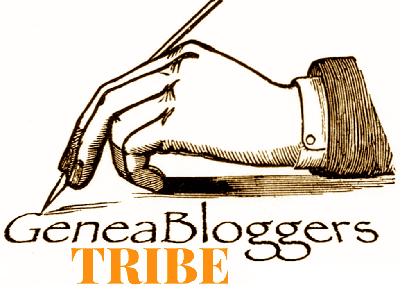 Sorry to hog this blog discussion with my recent experience but I'm SO happy!!! THANK YOU JANICE!! Hooray! I'm glad someone translated the stone for you. Some variation in birth years is expected, but that's more than ten years. The first thing to do is make sure it's the right person. Then keep in mind that the information on the stone depends on (1) what someone told the stone cutter and (2) how accurately the stone cutter rendered that on the stone. It's possible that Yaakov Levi means that Yaakov was the son of Levi, but I suspect it's more likely that the Levi on the stone is simply saying that Yaakov was a Levite, i.e., a descendant of the priestly class. I think normally that's rendered Ha-Levi on tombstones. Don't worry about hogging the dicussion. I'm happy for you! The info I needed translated was not on a stone but on a Matrikel record in Altenstadt Germany. I have 2 Matrikels and Jacob Levy Rosenheim's death record. He's listed as Jacob Levy Rosenheim on his death record. I learned recently that if a person was a Levite, there will probably be a carving of a jug of water with 2 hands (Kohns) pouring it. Check this out: http://www.jcam.org/Pages/Foundation/cemeterysymbols.htm but I have no picture or location of his grave. Yaakov Levi born on the first day of the second Adar in the year 5532. A Jewish leap year has two months of Adar - Yaakov Levi was born on the first day of the second Adar. When a month has 30 days (as does Adar I) its 30th day is considered part 1 of the beginning of the next month, and day 1 of the next month is part 2 of the beginning. The beginning of a month is a festive day, it's called "Rosh Khodesh. The very first day of Adar II is therefore "2 of Rosh Khodesh" and this is what we see in this text: "the second of Rosh Khodesh Adar II"
YIKES!! Am I more stupid than I thought or is this just middle age fog syndrome? It isn't middle age. The Jewish calendar is confusing. That's one of the reasons I'm happy to ask other people who are more skilled than I in Hebrew to translate tombstones. Lack of symbols indicating Levite or Kohan status on a tombstone does not mean the family was not Levite/Kohan, just as having the symbols on the tombstone does not automatically mean the family ws Levite/Kohan. Sometimes the person who gives instructions to the stonecutter is wrong. You're better off using information from the tombstone as a glue and then relying on research to give you the answer.